Rome–Fiumicino International Airport "Leonardo da Vinci" (Italian: Aeroporto Internazionale di Roma–Fiumicino "Leonardo da Vinci") (IATA: FCO, ICAO: LIRF), is an international airport in Rome and the major airport in Italy. 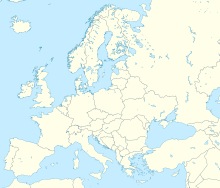 It is one of the busiest airports in Europe by passenger traffic with almost 43 million passengers served in 2018. Rome–Fiumicino International Airport "Leonardo da Vinci"
Aeroporto Internazionale di Roma–Fiumicino "Leonardo da Vinci"
The airport serves as the main hub for Alitalia, the largest Italian airline and Vueling, a Spanish low-cost carrier owned by International Airlines Group. Based on total passenger numbers, it is the eighth-busiest airport in Europe and was the world's 47th-busiest airport in 2017. It covers an area of 16 km2 and is named after polymath Leonardo da Vinci who, in 1480, designed a flying machine with wings and the first proto helicopter. The airport was officially opened on 15 January 1961, with two runways, replacing the smaller Rome Ciampino Airport, which remains in service for some low-cost airlines as well as domestic and charter operations. 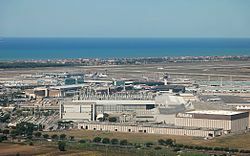 Despite being officially opened in 1961, Leonardo da Vinci–Fiumicino Airport had actually been in use since 20 August 1960. This was to help relieve air traffic that was congesting Rome Ciampino Airport during the 1960 Summer Olympics. During the 1960s, home-carrier Alitalia invested heavily in the new airport, building hangars and maintenance centres; in the same period a third runway was added (16L/34R). Security Services transferred from the Polizia di Stato (Italian State Police) to Aeroporti di Roma S.p.A. in 2000. Aeroporti di Roma created ADR Security S.r.l. (100%-owned) to provide these services as well as security services to airlines (in competition with other security companies such as IVRI). Airport Security is supervised by Polizia di Stato, Guardia di Finanza (Italian Customs Police), Italian Civil Aviation Authority and Aeroporti di Roma S.p.A.. Ground handling services were provided by Aeroporti di Roma until 1999, when it created Aeroporti di Roma Handling (to serve all airlines except for Alitalia, which continued to be handled by Aeroporti di Roma itself). Alitalia provided passenger assistance even before 1999. In 2001, Alitalia created "Alitalia Airport" and started providing ground handling for itself and other airlines. Aeroporti di Roma Handling remains the biggest handler in terms of airlines handled, but Alitalia Airport is the biggest handler in terms of airplanes handled as Alitalia aircraft account for 50% of the ones at Fiumicino. In May 2006, Italy's Civil Aviation Authority announced that it took off the limitation of 3 ramp handlers in Rome Leonardo da Vinci airport. ARE Group and Aviapartner announced that they would create a company called Aviapartner (51% Aviapartner; 49% ARE Group) to serve Milan Malpensa and Rome Leonardo da Vinci. Since 2005 the airport operates a category III B instrument landing system (ILS). Further improvement work was implemented in 2007 to enable the airport to handle 30 takeoffs/landings per hour, up from 10, in the event of thick fog. Four runways presently operate at Leonardo da Vinci airport: 16L/34R and 16R/34L (separated by a distance of 4,000 m (13,000 ft)), 16C/34C (close to 16L/34R), mostly used as a taxiway or as a backup for 16L/34R, and 07/25, used only westwards for takeoffs owing to the prevailing winds. In 2010, the new single baggage handling system for more efficient luggage delivery began operations. Several projects are planned. These include the construction of an environmentally-friendly cogeneration system, which would allow the airport to produce its own energy; construction of Pier C (dedicated to international flights) with 16 additional loading bridges, to handle the expected growth from 38 million passengers per year in 2014 to 55 million by 2018; and the "Masterplan Fiumicino Nord", involving four new terminals and two new runways to be built in the future and there are estimated to be 100 million passengers per year. The airport currently features three passenger terminals, of which two are operational. Terminal 1 (Gates B1–B13 and B14–B30) is used by Alitalia and other SkyTeam airlines. Terminal 3 (Gates C8–C16, D1–D10, E1-E8, E11-E24, E31-44 and E51-61) is the largest terminal which is used by most of the companies. Terminal 5 (under refurbishment) (formerly Gates E1-E8, E11-E24, E31-44 and E51-61) was used by all U.S. and Israeli carriers. This terminal is currently closed for extensive renovation. The terminals were upgraded during the 1990s and 2000s. In 1991, the domestic Pier A with 12 gates opened. In 1995, the international Pier B with 10 gates opened. In 1999, the international Satellite C with 14 gates and an elevated automated people mover, called SkyBridge, connected it with the main terminal. In 2000, the new domestic Terminal A opened, and the terminal buildings, then consisting of Terminal A (with Pier A), Terminal AA, Terminal B (with Pier B) and Terminal C (with Satellite C), were reorganized. In 2004, the new Cargo City terminal opened. In 2008, Terminal 5 opened for check-in for American carriers and El Al. Passengers are then bused to what was then called Satellite C. The terminal serves 950,000 passengers per year. In 2009, the terminals were renamed — A was renamed T1, AA was renamed T2, B and C became T3 and T5 stayed the same. The former Terminal 2 has been closed permanently on 15 December 2017 to make way for the expansion of Terminal 1. Fiumicino Aeroporto railway station is served by the Leonardo Express train operated by Trenitalia, available at the airport terminal. It takes 30 minutes to get to Termini Station in a non-stop trip that is provided every 15 minutes. Alternatively, local trains (FL1 line) leave once every 15 minutes, stopping at all stations. However, these trains do not head to Termini station. Passengers have to change at Trastevere, Ostiense (Metro Piramide) or Tuscolana. The railway opened in December 1989, with nonstop and several stop services available. Leonardo da Vinci is about 35 km (22 mi) by car from Rome's historic city centre. The airport is served by the six-lane Autostrada A91 motorway and numerous buses and taxis. From the 1960s until the 1980s, the airport experienced significant aircraft hijackings as well as being the scene of two major terrorist attacks and the port of origin for an aircraft bombing in flight—some engendered by Palestinians as part of the Israeli–Palestinian conflict. On 23 November 1964, TWA Flight 800, operated by a Boeing 707, had an engine catch fire during take off. 50 of the 73 passengers and crew on board were killed. On 17 December 1973, during the 1973 Rome airport attacks and hijacking, a Boeing 707-321B operating as Pan American World Airways (Pan Am) Flight 110 was attacked by Palestinian assailants. 30 passengers were killed when phosphorus bombs were thrown aboard the aircraft as it was preparing for departure. During the same incident a Lufthansa Boeing 737 (D-ABEY) was hijacked and landed at Athens, Damascus and finally in Kuwait. All remaining passengers and crew were then released. One person died in the incident. On 27 December 1985, during the Rome and Vienna airport attacks, assailants shot and killed 16 people and wounded 99 others at the airport. On 17 October 1988, Uganda Airlines Flight 775 from London Gatwick to Entebbe International Airport via Fiumicino, crashed short of the runway after two missed approaches. Twenty-six of the 45 passengers aboard, as well as all 7 crew members, died. On 2 February 2013, Alitalia Flight 1670, en route from Pisa International Airport to Rome, overran the runway during landing. Sixteen occupants were injured, two of them seriously. On 29 September 2013 at 20:10, an Alitalia Airbus A320 flying from Madrid Barajas Airport to Rome Fiumicino Airport failed to deploy the landing gear during a storm on landing and the aircraft toppled, skidded off the runway and crashed. 10 passengers suffered minor injuries and all 151 passengers and crew were evacuated and taken to hospital. The crash is still being investigated. ^ "EAD Basic". Ead.eurocontrol.int. Retrieved 25 April 2014. ^ "Fiumicino: Italy's Fast Growing Airport | Italy". Lifeinitaly.com. Retrieved 25 April 2014. ^ "Alitalia adds Rome - Milan Bergamo service from late-July 2019". routesonline.com. Retrieved 13 November 2018. ^ Liu, Jim. "Hainan Airlines adds Shenzhen – Rome service from late-May 2019". Routesonline. Retrieved 25 March 2019. ^ "Air France to conclude JOON brand in late-June 2019". Retrieved 22 February 2019. ^ "Kenya Airways resumes Rome / Geneva service in June 2019". routesonline.com. 23 January 2019. Retrieved 23 January 2019. ^ "Mahan Air adds Rome service from July 2019". routesonline. Retrieved 15 April 2019. ^ a b c d "Flight Times". neosair.it/en. ^ "Italy 2018 Civil Aviation Statistics" (PDF) (in Italian). ENAC. 28 March 2019. Retrieved 31 March 2019. ^ a b Cite error: The named reference ENAC 2018 was invoked but never defined (see the help page). ^ Flight International. 23 May 1987. 5. ^ a b "Hijacking description: Monday 17 December 1973". aviation-safety.net. Flight Safety Foundation. 11 February 2015. Retrieved 11 February 2015. ^ Official Italian accident report issued by ANSV and its english translation. Aviation Accidents Database. Retrieved 25 February 2017. ^ Posted by foxcrawl at 2:31 am. "Carpatair ATR-72 plane overruns runway on landing in Rome". Foxcrawl. Retrieved 6 February 2013. ^ Squires, Nick (4 February 2013). "Alitalia paints over crashed plane's markings". Telegraph. Retrieved 13 February 2013. ^ Matt Blake (30 September 2013). "Alitalia plane carrying 151 passengers crash lands in Rome after its landing gear fails to open in a storm | Mail Online". London: Dailymail.co.uk. Retrieved 17 January 2014.